The new Quebec City Arena currently under construction and expected to open this September will now be called The Videotron Centre, after the wireless carrier’s parent company Quebecor, won naming rights in 2011. The new official name of the arena was announced today in a press release. “With this name change, Quebecor is renewing its original commitment to make the Québec City Arena — now to be known as the Videotron Centre — a resounding success that will benefit the entire Québec City community,” said Benoît Robert. The deal will see Quebecor manage the Videotron Centre for 25 years, in a deal worth $33 million to the City of Quebec, once the arena’s construction has been completed. 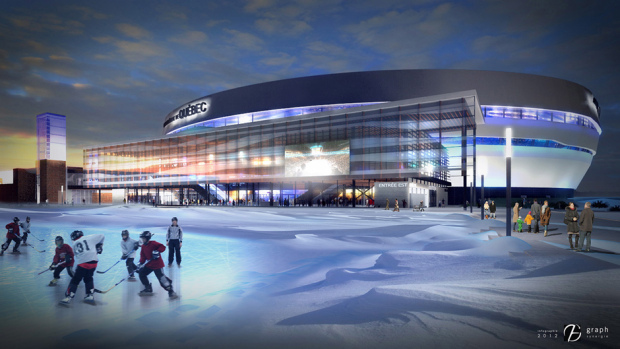 If Quebecor buys an NHL franchise and uses the arena, it will pay Quebec City $63,500,000. Quebec City lost its NHL franchise when the Nordiques moved to Colorado in 1995. Taxpayers have paid nearly the entire $400 million amount for the arena ($200M from the province; $187M from Quebec City; $13M from the community), whose 18,500 seats are set to lure an NHL team back to the city. However, the current economics of hosting an NHL team have left skeptics about whether professional hockey could return to the city. With the current Canadian exchange rate and the average cost of an NHL team pegged at roughly $490 million, some doubt a city of 700,000 could support a franchise and turn a profit for owners. Will the NHL land in Quebec City again? Maybe. But with a recent “Vegas Wants Hockey” ticket drive in Sin City surpassing 9,000 season ticket commitments, some suspect a new team will debut in the U.S. instead.